One digital tool available in NewsFrames is Media Cloud, an open source platform developed by the MIT Center for Civic Media and the Harvard Berkman Klein Center for Internet and Society. Media Cloud is designed to aggregate, analyze, deliver and visualize information, while answering complex quantitative and qualitative questions about the content of online media. The completeness of Media Cloud information can vary, depending on the open web information available for a given outlet. Assumptions about what should go into country collections can also differ. It is important to keep this in mind: work with your NewsFrames team members to understand the scope and limits of Media Cloud data. Additions to this data may be possible as well, based on need and availability. There are tasks that must be done every day in every newsroom. Using Media Cloud’s tools, it will be possible to do them with greater speed and precision. In the first 24 hours after a story breaks, it's valuable to be able to quickly get an overview of the context of the story. However, it's often challenging for small teams to find time to do this. 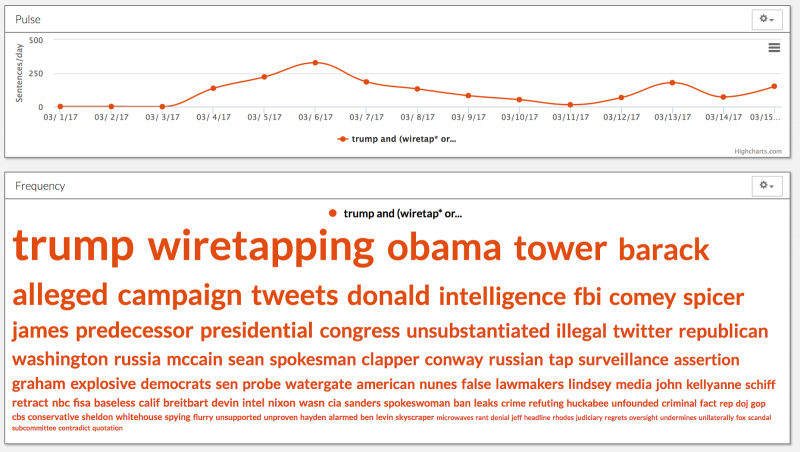 While we can use Media Cloud at a basic level to see what is happening in the short term (trending and breaking – but mostly after the fact), we can also use this tool to look at how stories develop over weeks and months. Media Cloud can also be used to quickly find news published in different regions of the world. Editors and authors can take advantage of the Media Cloud to identify relevant sources for their reporting. Providing context is an important part of covering ongoing news, such as election campaigns, protest movements, armed conflicts and popular memes. Media Cloud can be used to search for this contextual information. It's also possible to locate, in a timeline, stories that were published at the moment the issue emerged in the news. Media Cloud can also conveniently generate an archive of previously published articles that could be used to add context to your story. 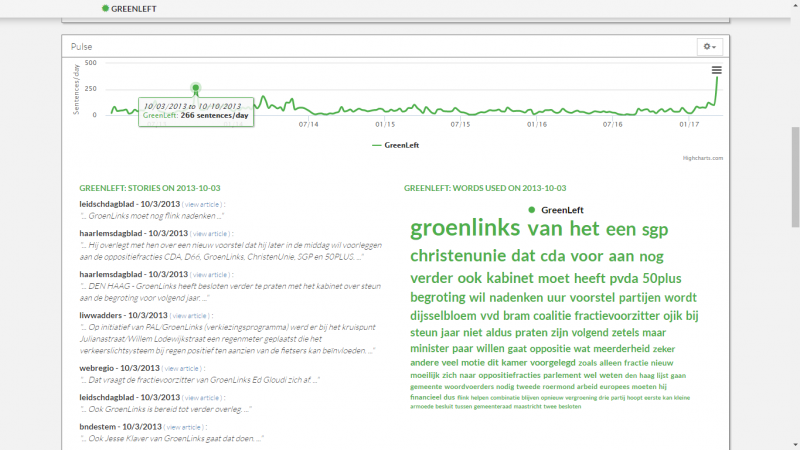 Media Cloud can also be used to search for background on people (for example, candidates in a presidential election) or companies (for example, mining companies). 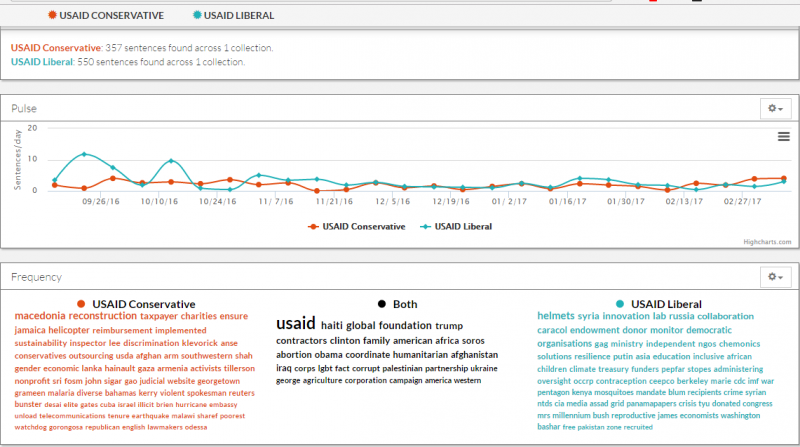 In another example, Media Cloud allows journalists to investigate how different news stories frame George Soros foundation-funded projects in Macedonia. Note: occasionally articles don’t have enough metadata and the dates you see are sometimes best guesses, so click on the link to the article (shown as “view article” above) to verify the publication date. It could also be that an evergreen article has been updated and republished. If you have further questions about a specific example, check with the NewsFrames team. Media Cloud is useful for understanding “media environments,” or media coverage in defined countries or regions. By using filters, Media Cloud can also be used to compare media types (e.g., digital native vs. mainstream) or coverage across the political spectrum (e.g., liberal vs. conservative) within its collection of sources. This can be useful for research in media studies, students of journalism, and also for journalists to assess the quality of media coverage. 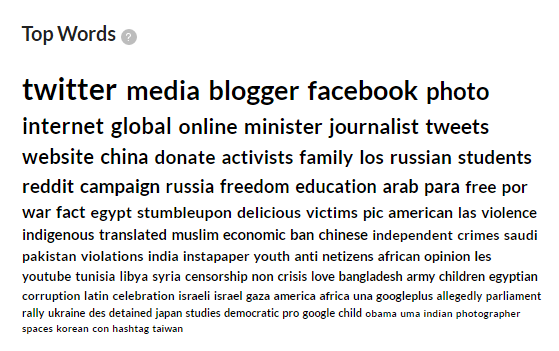 Media Cloud can be used to compare how the same topics are covered in media across different countries and languages. Queries in Media Cloud that compare coverage on a specific topic between two media collections can allow you to see what nouns and adjectives are used to refer to different news actors and processes in which they participate. The use of different words to refer to the same topic (e.g., “USAID”) can expose the tendencies or biases of each media discourse regarding actors or processes. However, note that collections are built with specific analysts and problems in mind—“conservative” may not mean the same thing to all users, and media outlets coverage may change over time. For the time being, Media Cloud users must assemble their own lists of, for example, “conservative” or “liberal” sources they have identified and classified themselves. Editors and authors can reflect on the coverage within Global Voices itself. What topics does GV tend to cover most? What is the slant or angle? Which countries are covered most frequently? In addition, Media Cloud includes of a “media collection” or database specifically of sources cited by Global Voices in 2013. Global Voices editors could, for example, easily plan small projects to investigate what biases or tendencies exist in sources commonly used by Global Voices authors. These sources could be “explored” or “discovered” by a topic or issue, such as refugees. Explain how the media frames the news. To get an idea of the kinds of stories you can produce using Media Cloud, take a look at Fighting For, Not Fighting Against: Media Coverage and the Dakota Access Pipeline. In a subsequent guide, we will cover how journalists can use Media Cloud for in-depth reporting.